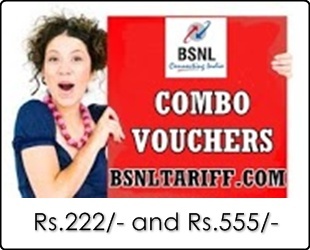 Most-Trusted Telecom Brand Bharat Sanchar Nigam Limited (BSNL) has introduced two new Combo Topup Vouchers under GSM Prepaid Mobile Services as promotional basis for limited period across Tamilnadu Telecom Circle (Including Chennai Telephone District). The Combo Topup Voucher of Rs.222/- offers, Rs.190/- Usage Value and Free 110 Minutes On-net Calls with validity for 40 days. The Combo Topup Voucher of Rs.555/- offers, Rs.470/- Usage Value and Free 280 Minutes On-net Calls with validity for 90 days. The above Two Combo Topup Vouchers are available through Easy Recharge (C-Topup) and applicable for the following all current plans, Life Time, Per Second, Per Minute, General, Student Special, Anbu Jodi, Roam Free plan, Jai Jawan, 3G Data plan General/Perminute, Nesam Group of plans including NESAM GOLD, BSNL Simple Plan 100, RTP-FR Plan and Saral Ananth plan. Note: Validity in days is meant for Free On-net calls only and will not increase the main account Validity. The above two new Combo Topup Vouchers will be implemented and with effect from 01-08-2013 to 31-08-2013 (for one month).